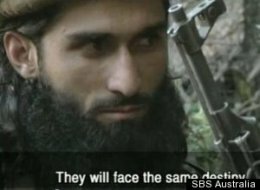 —-An extraordinary, modest short film about a group of Taliban fighters was recently shown on Australian television and now appears on the Huffington Post. Despite considerable anxiety about his own safety, Paul Refsdal, a Norwegian cameraman, traveled with a group of men and boys into the mountains of Afghanistan. His work is intimate and revealing, and portrays these Taliban as much less demonic (compared to their depiction in most of the Western press), exhibiting fear for their own lives and concern for children, as well as a certain amount of honor and a great deal of faith, and most of all wanting to be left alone. Behind Enemy Lines (an unfortunate title) is a great companion to Restrepo or Brian Palmer’s Full Disclosure (reviewed here), and a reminder that none of us has a monopoly on passion, frailty, or humanity. This was written by fredritchin. Posted on Sunday, August 29, 2010, at 11:27 pm. Filed under Journalism, The World. Tagged Behind Enemy Lines, Paul Refsdal. Bookmark the permalink. Follow comments here with the RSS feed. Post a comment or leave a trackback.